It appears the world can’t get enough of fashion’s leading ladies, who have been strutting their stuff down many a catwalk for this seasons AW/13 shows. Not only do the likes of Alessandra Ambrosio, Miranda Kerr and Cara Delevingne have a huge fan base in the real world, it’s become apparent that their online social media popularity is also sky high. ‘America’s Next Top Model’ host and renowned supermodel, Tyra Banks is predictably strides ahead of the rest with a massive 11,277,305 Twitter followers, making her the most popular supermodel on Twitter and also Instagram (1.2 million). Brazilian beauty, Adriana Lima ranked second with 3,465,472 followers, whilst gorgeous yummy mummy, Heidi Klum ranked third with 2,870,248. Our personal favourite (and not just because she is married to Orlando Bloom) is Australian supermodel Miranda Kerr, who came fourth with an impressive 2,701,525 followers, however, ranked 2nd most followed on Instagram, just below Tyra. Gisele Bündchen came fifth with 2,421,171, followed by Cindy Crawford (1,322,443), who was then followed by plus size model Kate Upton (1,189,004). In eighth place was Victoria Secret’s model, Alessandra Ambrosio who at the time of the study had 1,161,765 followers, followed by Irina Shayk (891,235). 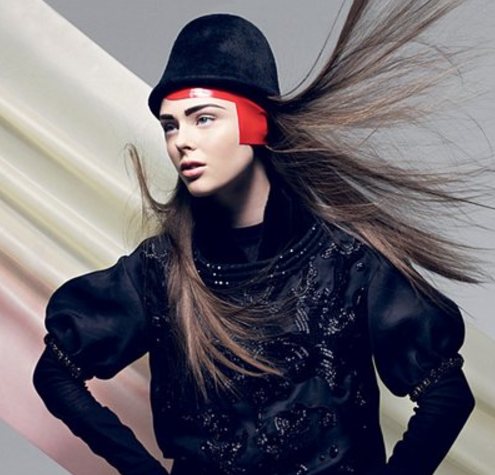 Last but not least, in tenth place, was ‘The Face’ model Coco Rocha who has racked up an astounding 798,138 followers. Modelinia gave an honorable mention to Naomi Campbell, who only joined Twitter two months ago and has already achieved an impressive following of 777,060, just a few thousand shy of Face co-star Coco Rocha. Model of the moment Cara Delevingne ranked third on Instagram, behind Tyra and Miranda with 797,727 followers, whilst Leonardo Di Caprio’s ex Bar Refaeli had 471,954 Instagram followers.